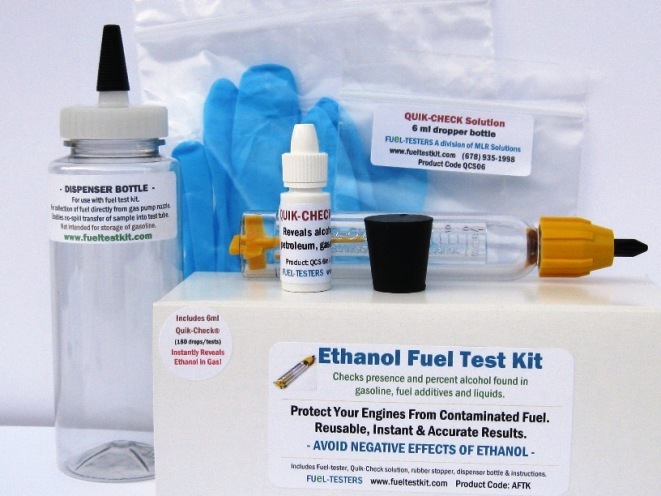 Clearance - Specials: Fuel-Testers Company. Limited Time Special Offers, Clearance + Imperfects. Includes bag, disposable gloves and instructions. See "imperfect" details below. 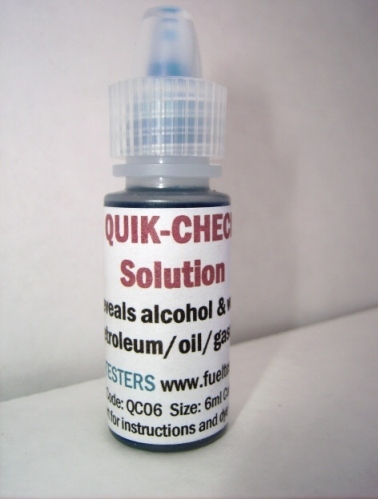 QCS instantly reveals alcohol and water presence in all fuel types and other oil-based liquids. More QCS product details and testing images here. * Packaging and/or labeling may be slightly imperfect with minor cosmetic flaws. Most often "imperfects" are due to crooked or misplaced label on box, bag or bottle. Will not effect test results in any way. Not for resale. Re-sealable plastic carry bag; 6ml Dropper Bottle Quik-Check™ Solution-6ml QCS=Approx. 180 drops/tests; Disposable gloves; Detailed testing instructions. Choose Deluxe Kit AFTKD15 or Click on stand (image right), or button to add to order +$4.90. 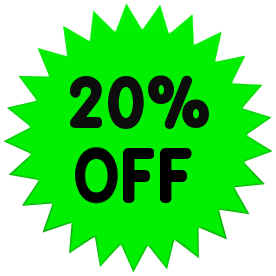 Volume discounts on 2 or more kits up to 30% Off EVERYDAY. Request Quote: We always offer special volume discounts for certified mechanics, engine manufacturers /dealers, and repair shops. Click to view price chart. Saves $8.00 per kit $23.95 ea. List Price/Recommended Resale Price=$31.95 ea. ADD-TO-ORDER: Individual products are available here. 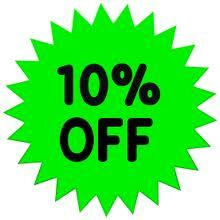 Save 10 to 30% off select items. 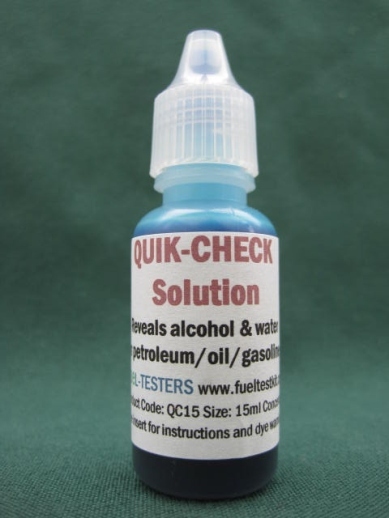 (Individual fuel-testers, quik-check bottles, stand for tester, and more). 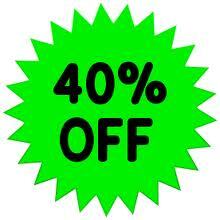 Please email us for current specials.